Can I treat my HVAC duct work using the FOG-U® MOLD product? Yes, that’s a perfect use for the FOG-U® MOLD product. The detailed recommended procedure is available here. Remove any filters from the system. Remove the register cover from the return furthest from the HVAC system. Shake well and discharge the entire can into open return and let the system circulate for 15 minutes. Replace any filters and replace the return cover. For multi-zone systems you should empty an entire can into each system separately. Where should I test using the 5-Minute Mold Test in my house? Any visible mold in the bathroom, kitchen, or any other rooms should be tested. If you are concerned about your general air quality in a specific room, it is best to sample dust in the space. Mold spores can float in the air for substantial periods of time but they can eventually attached to larger particles in the air and settle onto flat surfaces. These dust samples would be similar to an air sample taken by a mold professional except dust samples represent air sampled over a much longer period (essentially the time period back until the surface was last cleaned). Typically this settled dust would be taken from a flat surface such as bookshelf, window sill, top of a door frame, baseboard, etc.) in the room of concern. Alternatively, if your primary concern is a specific area showing suspected mold growth; you should sample the area directly or along the edge of the suspected area (a wet wall or ceiling for example). If you are concerned about both your air quality and specific suspect “moldy” areas you might consider purchasing multiple kits. Will the 5 Minute Mold Test detect mold growing in “hidden” areas that I cannot see? Yes, you can detect mold with the Healthful Home 5-Minute Mold Test, even if you cannot see it or get to it the place where you suspect growth, like behind a wall, for example. If mold is growing anywhere in the structure, mold spores will circulate in the air and settle into the dust which accumulates on horizontal surfaces; such as a the top of a door frame, the top of a picture frame or top of a bookcase. Simply sample and test this dust. Go to a central room in the house or apartment, the first floor is fine. Even if mold is growing in the basement or the attic, we can detect it. Using the collection swab, sample settled dust on a flat, horizontal surface (bookshelf, window sill, top of door frame, etc.). Then run the test following the instructions enclosed in the box. The video on our home page also demonstrates such sampling. What do I do with the 3 paper-wrapped sterile swabs that come in the test kit? The 3 sterile swabs are used when sending additional samples into the AIHA-certified laboratory for confirmatory analysis. They are not used for the Do-It-Yourself 5-minute Mold Tests that you conduct in your home. For laboratory analysis you would use one or more of the sterile swabs to collect samples that you can send using the pre-paid postal mailer that also comes in the kit. My test was negative for the first 20 minutes but when I looked at it the next day it was positive. What does that mean? The test should only be interpreted within 20 minutes after adding the liquid sample to the tests. Positive test that develop over extended periods or overnight are not unusual and represent the test drying out and should NOT be interpreted as positive result. Positive results can ONLY be interpreted during the first 20 minutes after adding sample. 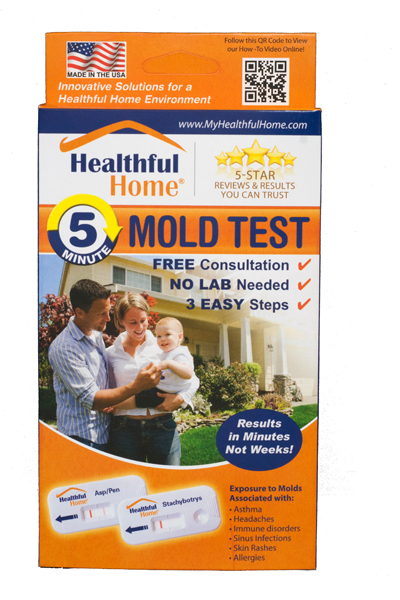 What are the advantages of the Healthful Home® 5-Minute Mold Test over other traditional mold test kits? Almost all the traditional mold test kits are really nothing more than collection kits for samples that need to be sent into a laboratory for analysis. These types of kits cannot distinguish between problem molds and everyday types of mold unless you send it into a lab for an additional fee. Further, settling plates typically require two kits be purchased so that you can compare outdoor levels of mold to inside levels. When you add up the costs for additional fees and lab testing, such kits will cost the average user $80 to $100 for each location tested. Clearly, there is no savings in such methods and they can take up two weeks to obtain lab results. At the end of the day, such “low-cost, do-it-yourself” mold test kits are neither low-cost nor do-it-yourself. Our test does not require any additional fees to determine specific mold types and it’s easy to do yourself, right at home in minutes! Thus the Healthful Home 5-Minute Mold Test kit is the real bargain when all is considered. Severe reactions may include fever and shortness of breath. Immuno-compromised people and those with chronic lung diseases like COPD are at increased risk for opportunistic infections and may develop fungal infections in their lungs. Skin disorders and eye issues are also reported. In 2004 the Institute of Medicine (IOM) found there was sufficient evidence to link indoor exposure to mold with upper respiratory tract symptoms, cough, and wheeze in otherwise healthy people; with asthma symptoms in people with asthma; and with hypersensitivity pneumonitis in individuals susceptible to that immune-mediated condition. The IOM also found limited or suggestive evidence linking indoor mold exposure and respiratory illness in otherwise healthy children. Many mold inspectors claim home tests are a waste of money because mold is everywhere…won’t this test give me a positive every time? No. However, this is true for Petri dish-type tests that don’t discriminate between background and water-damage type molds. The Healthful Home 5-Minute Mold Test is set to detect a concern level of water-damage molds, not just routine mold type. This is confirmed by the fact that many of our customers report negative test results with our kits. In regards to dangerous Stachybotrys mold species, any amount detected would be a cause for concern and having a specific Stachybotrys test is one of the most powerful features of our kit. How many Healthful Home test kits do I need? A single kit will suffice if you wish to sample a single area or room. It is entirely acceptable to sample multiple areas for testing but the result will reflect the “average contamination” for entire area. Thus, if one area is particular heavy in mold and the other areas are not, you will not be able to isolate the badly contaminated area with a single kit. If you wish to evaluate particular rooms or areas you may wish to use a single kit for each area and be more accurate. A good rule of thumb is to use a kit for each floor of a household as a starting point. If you are only concerned about a single room or you wish to test a visible suspected “moldy area”, a single kit is sufficient. Where should I test in my house? The Healthful Home 5-Minute Mold Test gave me a positive result. What does it mean? The Healthful Home 5-Minute Mold Tests are highly sensitive to specific mold types that are suspected to cause health issues. A POSITIVE mold detection result indicates that the area that was tested likely contains detectable levels of these molds. It does not indicate that you necessarily have a serious mold issue but rather that you should consider consulting with a professional indoor air inspector or remediation service professional. In some areas of the country, it is not unusual to have low levels of Aspergillus species from the outside environment that may produce a very weak positive result in the Healthful Home test. If the test appears as a positive, you can call us for a professional consultation at 800-455-1250. Further actions you may wish to take will depend on many factors including the extent of the mold infestation, your personal sensitivity to molds, the structural repairs necessary, the type of specific mold involved, the overall air quality in your living spaces and the costs involved. For serious mold issues, we are available for the aforementioned professional consultation and can provide you with the contacts or materials to treat your mold infestation. If I test my home myself, why might I still need a mold professional? Depending on the extent of your mold problem, some customers choose to bypass a professional mold inspection and either clean the mold themselves or contact a remediator directly to remove the mold. In cases where the mold contamination is small, an inspection may not be necessary. For those cases, we also provide our customers with an eco-friendly mold killing kit that kills mold, removes stains and then seals the surface area to prevent the mold from returning. Contrary to popular belief, bleach doesn’t kill mold on many surfaces – it can even make it worse. We also have a network of highly professional mold inspectors and remediation specialists within our “Healthful Home” network and can recommend an independent inspector or remediator to ensure that your inspection service and/or remediation is performed up to standards. Does a NEGATIVE result mean I don’t have a mold issue? Not necessarily. Remember that there is mold everywhere around you. The question is at what level and whether certain individuals may be sensitive to the types that are present. Although Healthful Home 5-Minute Mold Tests are highly sensitive screening devices for specific mold types, a NEGATIVE result indicates only that the area sampled does not contain mold levels above a certain detectable level. It also does not conclusively indicate that there may not be a mold issue elsewhere in your home or office. A NEGATIVE result on a settled dust sample does give a general indication that it is unlikely you have a high mold spore level in the air spaces within the areas tested but absolute confirmation of the indoor air quality throughout your home or office space requires an examination by a qualified professional IAQ inspector. Who should I contact if I need the assistance of mold professional? Following mold detection, if you need further help, feel free to contact us for a professional consultation at 1-800-455-1250. We have a nationwide network of highly respected, experienced professionals under the Healthful Home brand that can assist you with any level of service you may need. We monitor the process from the beginning to end to assure your satisfaction and completion of whatever work needs to be done. How sensitive are the Healthful Home tests to mold? How many spores can it detect? The tests are able to detect as little as 500 mold spores within 15 minutes after sample has been added to the strip. At high levels of spores, the test can show a positive result within 2 minutes of sample being added. What does it cost to send in a sample for laboratory analysis and how long does it take to get results? Laboratory confirmatory analysis costs $29 per sample submitted. Results are reported by email within 24 business hours of receipt of the sample to the lab. Transit time for the samples via First Class USPS mail can take 3 – 7 days for delivery to the lab depending on your location. For fastest result turn around, samples should be sent to the lab using an overnight delivery service such as FedEx or UPS. The lab address in on the pre-paid mailer that comes in every kit. 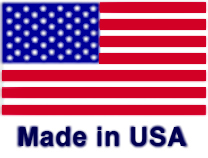 Detects only the most worrisome molds and includes professional consultation.